The island of Pharos was a major port having two huge harbors. 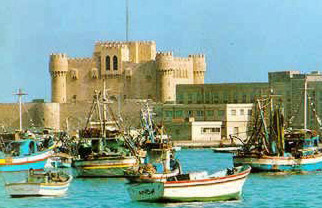 The Fort was built in the 1480's by Sultan Qaitbey, on the site of Alexandria's ancient lighthouse. Parts of the remains of the lighthouse can be seen in the construction of the old fort. One of the seven wonders of the ancient World, the lighthouse was an astonishing 125m in height with approximately three hundred rooms at the bottom for workers. Running through the center was a double spiral ascent and hydraulic machinery that raised fuel to the top. The lantern at the top of the lighthouse remains a mystery. Some say it contained a polished steel mirror that reflected light by day, and fire by night. Others say it was made of transparent glass. The lantern and the top two stories fell around 700 AD according to many reports, and the rest of the lighthouse was destroyed by an earthquake around 1100. In its place a Mosque was built, which was damaged by an earthquake in the 14th century. The entrance is through a gateway made of red Aswan granite. Located beside the mosque is a cistern that was used to store water in case of a siege. Also located inside the fort is the Naval Museum which contains artifacts from the Roman and Napoleonic sea battles.